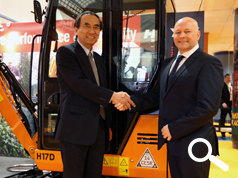 Hanix announced on the opening day of EHS 2014 that is had adopted CESAR equipment security and registration for its mini-excavators. It's machines at EHS featured the now familiar triangular registration plate. The second day of EHS presented an opportunity for the two Managing Directors to meet. 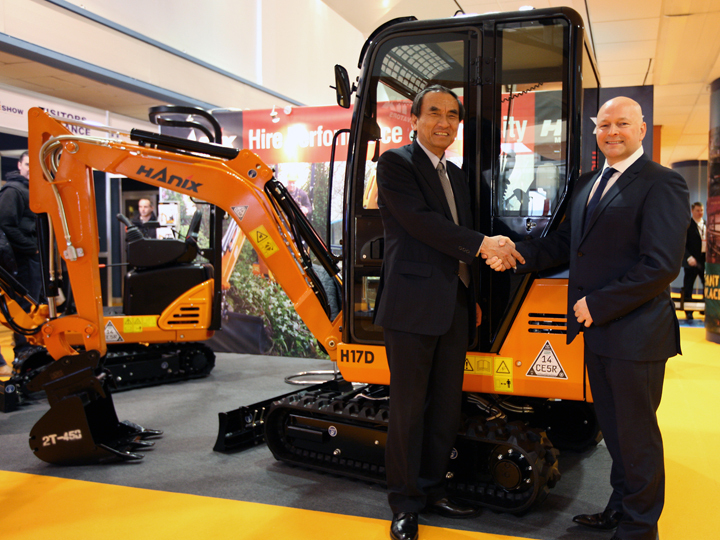 Mr Michiro Ito of Hanix and Mr Kevin Howells of Datatag discussed the current market and equipment security during a meeting on Thursday on the Hanix stand. Mr Howells commented, "I'm delighted that yet another leading supplier has adopted CESAR. In the past 7 years we have had a succession of leading manufacturers taking the positive step of adopting CESAR and as a consequence equipment theft has been drastically reduced in the UK. Our challenge now is to encourage now is to encourage the wider adoption of CESAR, a powerful deterrent against theft and an invaluable aid in recovery.". CESAR is the world's most successful equipment security scheme protecting over 135,000 pieces of equipment. Powered by Datatag security technology CESAR is marking 7 years of success in 2014. The ‘CESAR effect' has reduced overall equipment theft by 46% in the past 3 years, increased the rate of recovery of stolen equipment by a factor of 6, and helped reduce insurance premiums on equipment.